BBC to stream FA Cup matches in 4K HDR on iPlayer | What Hi-Fi? Following a number of successful trials in 2018, we'd been wondering what 4K content the BBC iPlayer would serve up next. And now we know. The BBC will be streaming both the 2019 FA Cup semi-final between Manchester City and Brighton (6th April) and the FA Cup Final (18th May) through iPlayer in Ultra HD resolution, complete with HLG HDR (High Dynamic Range). If you've got a compatible 4K TV, you can either hit the red button to access the stream or go through your TV's BBC iPlayer app. As with previous trials, space on the service will be limited to "tens of thousands", and the BBC recommends an internet connection with a minimum speed of 40Mbps for the full-fat 4K experience of 3840 pixels at 50 frames per second or 20Mbps for a horizontal resolution of 2560 pixels. It also suggests (as would we) a wired connection will give a more stable connection than streaming over wi-fi. "Our Ultra HD and HDR programmes have been streamed millions of times on BBC iPlayer, making them some of the most popular Ultra HD programmes in the world" said Dan Taylor-Watt, Head of BBC iPlayer. For the first time, the BBC will use the 4K trial as its main production and will take its HD and SD coverage from that workflow. 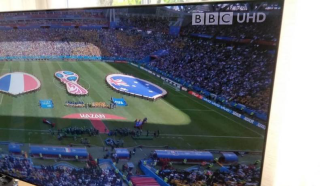 The streams will also be used by the BBC to help refine its technology for reducing latency, which is normally experienced by a viewer of the 4K stream compared to the live broadcast. The BBC has delivered a decent chunk of 4K HDR content through its online player in the past 12 months, including games from the FIFA World Cup and the Wimbledon tennis championships so it's good to see the first 4K instalment for 2019. BBC 4K iPlayer: What's next?